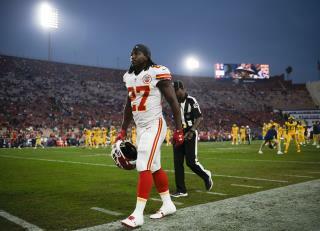 (Newser) – The NFL has suspended Kareem Hunt for half of next season after an investigation of off-field violence involving the Pro Bowl running back. Hunt said he won't appeal the decision, Cleveland.com reports, and the Browns tweeted his statement saying, "I know that my behavior hurt a lot of people, and I again apologize to them." Hunt added that "there is a lot of hard work ahead of me before I'm able to fully return to playing the game I love." Missing the first eight games of the season will cost him about $503,529, under the contract he signed with the Browns only last month. Since then, their general manager says, "He has really done a nice job of being committed and of doing that work so that he can be the best version of himself." If not in the NFL half of them would be in jail or running a forklift in a warehouse.